Our oil free air compressor & vacuum pump ranges are the result of innovative technology for Hospital. All critical parts are manufactured in cnc machines. Take a look at this unique package system. 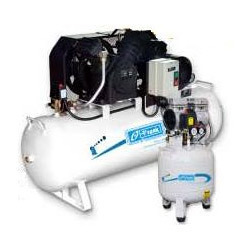 It is an advanced 100% oil free reciprocating compressor based air system. Totally engineered, plant tested, proven in performance. Comes in tank mounted version. Needs no foundation. Requires very little time and labour in installation. Ready to use. Just plug in to the power outlet, and enjoy quality compressed air. Different models are available for domestic, medical, professional and industrial use. advanced concentric disc valve technology specifically designed and adopted exclusively for frank compressors, they ensure uninterrupted operation and long service life. As a result, you only need an annual shut- down for maintenance. manufactured on computerized spms, the perfect concentrically and flatness provides close tolerances and ensures an aerodynamic flow for low resistance. All of which means higher reliability, least valve losses & power savings. Guaranteed 100% Oil free Air. Advanced concentric disc valve technology. Light weight piston & teflon ring. One piece bearing suited for near life time operation. Overhung crank shaft for easy maintenance. We have expertise in manufacturing and trading a comprehensive array of Compressed Air Treatment Products, Water Cooling Systems. We also provide services of cooling tower installation. Our products include Industrial Air Compressor (Lube/Oil Free), Refrigerated Air Dryer, Micro Filters, Water Chiller, Cooling Tower, Air Receiver & Pneumatic Accessories in Madhya Pradesh. Appreciated for their minimum maintenance, high performance and sturdy construction, these products are highly demanded in their respective application areas. Furthermore, these products can be availed from us in customised forms at nominal rates. Our organisation possesses a modern infrastructure that includes R & D unit, production department and quality control wing. These units assist us in providing our clients with nothing but the best. Moreover, these are managed by sedulous professionals, who make wise use of the resources and suggest new ideas to achieve maximum operational efficiency. As a client-centric organisation, we timely deliver our products and offer easy payment modes such as DD, cheque, credit card and cash. Looking for the queries from Indore Madhya Pradesh.